No one was more surprised than I was when I became an environmental activist. I was 36 years old, married, established in my career in social work, and busy with other things. I was never outdoorsy or athletic. I had no interest in science. To make a long story short, once I discovered my passion for fixing what human beings have done to harm the earth and each other, I had a lot to learn. Only a year after I dived into environmentalism by volunteering with the Sierra Club, I found myself enrolled in a PhD program in environmental psychology. I was so new to environmental studies that I had no idea what I wanted to study. One day, looking for a topic for a term paper, I typed “drinking water” into the search field for the New York Times archive. That was my lucky day. Not only did I find a topic for my paper, and eventually my dissertation, but I also found a role model. The topic of that fateful paper was a controversy over how to ensure the safety of New York City’s drinking water. A small but passionately committed group of grassroots activists had taken it upon themselves to challenge the decisions of the federal, state, and city governments. The regulators were convinced that pollution of the city’s Croton water supply was unavoidable, and the only way to ensure clean water was to build a huge filtration plant. The activists said, let’s not give in; let’s do everything we can to protect the water at the source, so filtration remains unnecessary. For seven years I tagged along with the activists of the Croton Watershed Clean Water Coalition (CWCWC) as they educated, rallied, and lobbied. They taught me everything I know about activism, from how to testify at a public hearing to how to stay focused despite the inevitable setbacks. My most important teacher was the chairperson of the Coalition, Marian Rose, a woman who chose to devote ten years of her life to the cause of New York’s water. The first lesson Marian taught me is that it is never too late to get started. Marian had done plenty before she took on the New York City watershed. She came to America with her family from Brussels, fleeing on the day in 1940 that the Nazis invaded. Resuming her education at Barnard, and then at Columbia where she worked on the Manhattan Project, and Harvard, she earned her PhD in physics. When she was told to her face that a woman couldn’t get a job in that field, she moved on to applied mathematics. She worked throughout the years and raised her four children. It was only after she retired that she became president of the CWCWC at the age of 78 and served for ten years. The second lesson she taught me is about passion. Marian doesn’t seem like the kind of person who would let her passion take over her life. Maybe it is her European upbringing or that she is a scientist. Whatever the reason, she doesn’t talk about herself. She seems reserved and proper; but that is all superficial. In my first interview with her, Marian said, “To me the watershed is a living being, and I have to protect it.” If Marian could follow her passion, so could I. Before I met Marian, I used to worry a lot about taking the “right” political position. Environmental issues are complicated. Often the ideal solution seems unrealistic, in light of the political and economic realities. In the long, drawn-out conflict over the construction of the water filtration plant, the CWCWC took an extreme position. Marian and the other activists argued that the plant should not be built at all. They believed that instead of spending billions of dollars on an end of the pipe technical fix to the problem of non-point source pollution, it would be better to strive for the ideal solution—preventing pollution in the first place. Contrary to the position of these activists, the established environmental organizations went along with the government regulators and accepted that construction of a plant was unavoidable. These organizations work within the system and they have to compromise to achieve their goals and maintain their relationships. Grassroots activists, like Marian, who don’t have these ongoing political relationships, have the freedom to take more extreme positions. I realized that everyone has their role to play. Sometimes there is more than one “right” position. The important thing is to be brave enough to take a stand. That’s the third lesson I learned from Marian. I learned a lot from the hundreds of books and articles I read for my research, but Marian’s example changed my life. My passion is to awaken Jews to act on our values and respond to the urgency of climate change. In 2009, I organized a Jewish statement calling for action and went to the UN Summit on Climate Change in Copenhagen. I am also a leader of Jews Against Hydrofracking, which seeks to engage Jews in the struggle against the expansion of this dangerous method of fossil fuel extraction. I know how to make a difference. Thank you, Marian. Dr. Mirele B. Goldsmith is an environmental psychologist, educator, and activist. 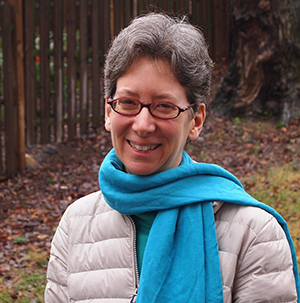 Currently, she directs the Jewish Greening Fellowship, a groundbreaking effort to engage nonprofit agencies in the New York area in reducing energy use, implementing sustainable operations, and educating their communities about climate change. Mirele created the Tikkun Mayim, a ceremony of repair for our relationship with water, and is a founder of Jews Against Hydrofracking. Mayim: A long time ago, I wanted to study Biology. I was seeking something in life to give meaning, and I can say, I have spent the greater part of my life, as a seeker. I find the words Seek and You Shall Find, now that I am so much older, true, in more ways than I ever thought possible, and had I imagined, THIS would happen in my life, I would have deemed it a total fairy tale. But fairy and ferry are aurally synonymous, and I have been putting down a language based story, that only a Master Storyteller could have written, which is deeply contained by Words Themselves, all names, and naming. Mayim is so powerful. It’s the life force. Water! This beautiful story of how one woman turned her life around, found another mission, that I would say is also deeply social work, as I am also a social worker, is truly a great story, of activism towards what matters. When I consider the words of Thoreau: In wilderness is the preservation of the world, I am totally aware of the EAU in his name, not only was he thoroughly right, but EAU is water in French. I think this not random. Nor Thor being for thunder. Thunder on the mountain. We were at Sinai. We heard a voice. And since then, it seems God has migrated inwards, towards the “temple of our familiar” and yet it is the hidden, the still small voice, we are hearing, when it comes to a compassionate, caring universe. One verse. We must move forward together. There is a larger, a cosmic story, that is impelling change, and the changes, in caring for our water supplies, around the world, in reducing pollution around the world, in caring for people, and animals, and trees and the oceans, well we put in MOCEAN a massive sea change. And that’s the point. I am thrilled to be able to write on line, about a subject so dear. And a subject that is bringing some great people into Focus. This is a compelling message – it’s never too late to get started on something that you are passionate about. It’s also never too late to say thank you to a mentor and inspiration. I can say thank you to you, Mirele, for being both of these to me.